I NEED a smartphone because I dropped mine, and the glass shattered and broke into hundreds of little pieces. And now, when I use it, I get little shards of glass in my finger, and it hurts. Plus I am in big trouble, because it's a $200 fix. And that wasn't in the budget. Looks like I am getting my phone fixed for my birthday! YOU NEED A SMARTPHONE because it will help you tremendously when you are out at the yard sales. EBay has an app for your phone that is super easy to use. It allows you to refine your search to auctions both active and completed (completed is what you really want to see). If I am unsure about something I am considering purchasing, I spend 45 seconds checking it out on my phone. It has saved me from wasting my time and money, and it has led me to make some worthwhile purchases like the Shrunken Head kit and the American Girl Mini Cabana Playset that I had never seen or heard of before. Your smartphone can also be your Saturday morning GPS. I use the Mapquest app to find my yard sales and it saves me so much time. Additionally, you can get the Craigslist app for your phone and pull up the yard sales in your area! If you haven't planned ahead of time or find yourself with extra shopping time, you can find your next stop in a matter of seconds. 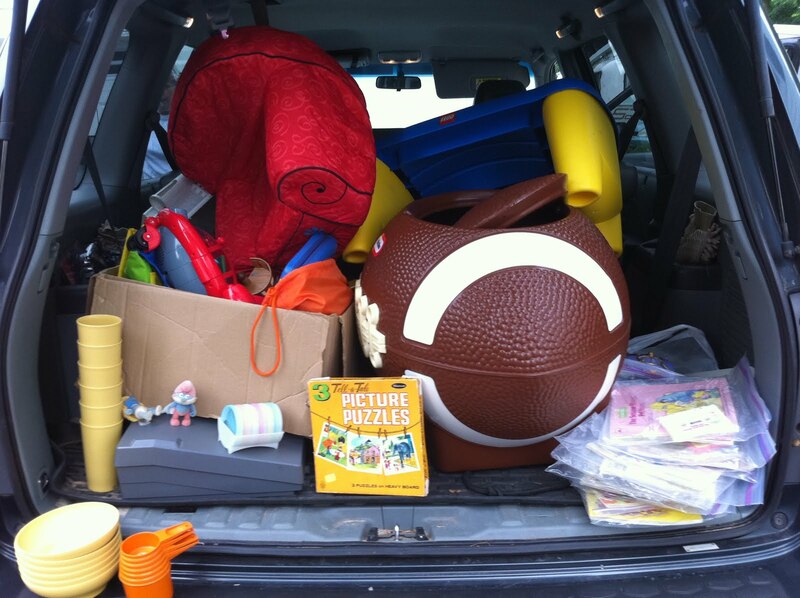 For more information about planning your yard sale, see my post here. Now, if you can't afford a smartphone or are not planning on getting one, don't feel bad. You can still make some money. 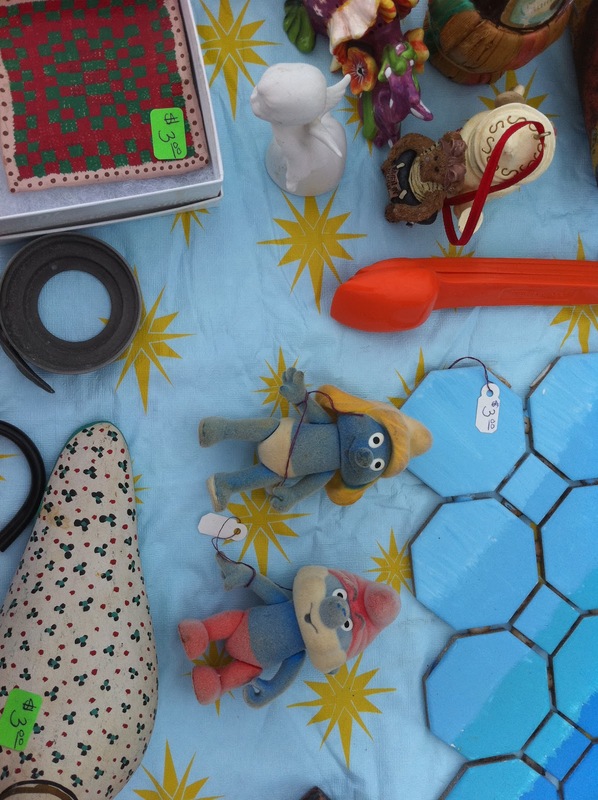 You may have to take a few more risks, but a yard sale risk is usually a $5 or less risk! When I do take a risk on something and it doesn't pan out or sell, I simply sell it for what I paid (or more) at a kids' consignment sale. I think that's a win-win situation! Charlotte decided to try "coloring" this week. She found two random crayons on the floor and her sister's math test (I'm some housekeeper, huh? ), toddled over to an open space on the floor, flopped down on her belly and decided to give it a try. I was impressed! The auctions are over, the night is done, and now the shipping begins. 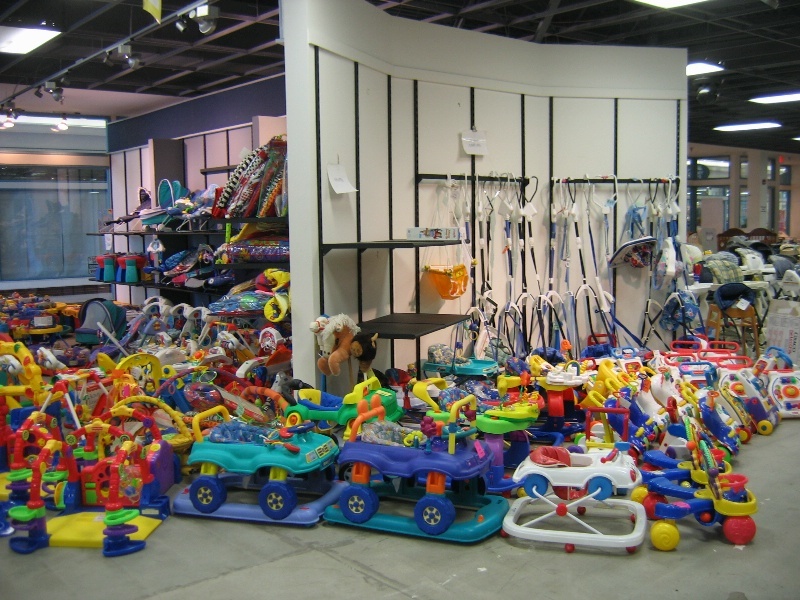 It was a good showing, especially for June which is typically a very slow month for toys! My Vintage Sewing Patterns: $9.99. I guess I didn't have good ones! I expected to get more. Brand new Dora Sheet set: Didn't sell. Dora must be yesterday's news. Lego Castle Set: $32.00. I only paid $3, so I shouldn't be complaining, but if I had the instructions and could have gotten it put together I would have made $50 more! Well, those are the things worth chatting about. I'm so thankful to God for anything that I make, as it is in His hands, not mine! I'm so enjoying your questions, emails, and comments. It's keeping me busy, busy, busy. I have a question for you...and you can answer honestly...I'm thinking about monetizing this site (whatever that means!) but would hate for you to think that I've "sold out"! Would that make me totally cheesy? I love the idea of helping YOU make some extra money. Would it be wrong for me to throw an ad or two up as a way to be reimbursed for my time? What are your thoughts? What to sell Wednesday: Let's Hear it for the Care Bears! Now I don't want to date myself, but I will say that I remember Care Bears from way back in the 80's. I remember the original Care Bears movie (which I think I saw in the theatre, I might add! ), the stuffed Care Bears, and the Care Bear figurines. I don't remember if I actually had any of these toys, but I do remember they were cute in a rainbows and butterflies sort of way. They were nice little friends, and with the exception of grumpy bear, not too terribly controversial. Of course these days, any of these vintage Care Bears can bring a nice little profit on ebay, but they are really hard to find and you just aren't going to see many if ever. So forget about those old 1980's Care Bears. Let's talk about the remakes!! 80's are in again, right? And so are the new Care Bears, which happen to be old again!! Does that make sense? Be on the lookout for the early 2000's (I think) Care Bear figures, castles, ferris wheels, airplanes, playsets, houses, etc., because these are discontinued (again!) and you can't find them in the store anymore. Hello, Rainbow Cake! Thank You, Pyrex Mixing Bowl! 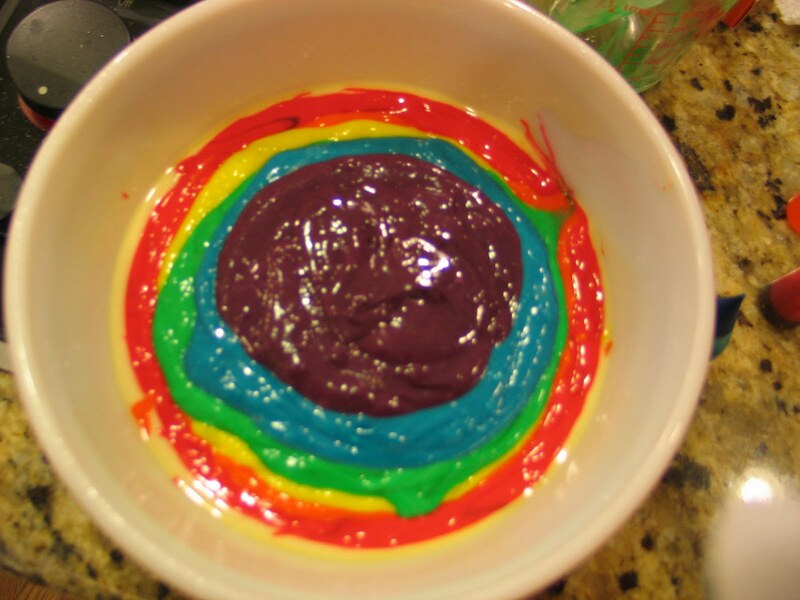 Today you'll find me over at The Pyrex Collective 2, sharing a story of how I made this rainbow cake in a vintage pyrex mixing bowl. Any size will do. 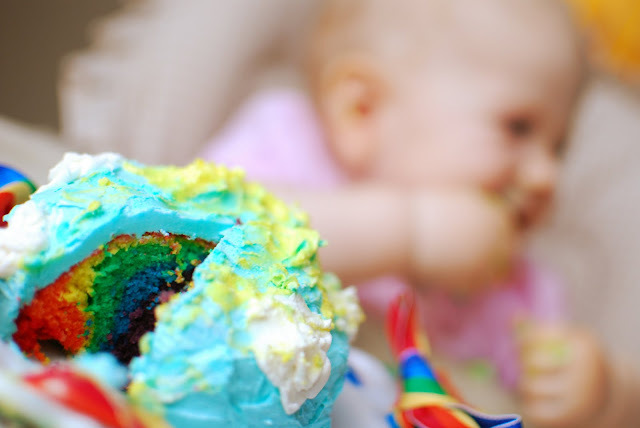 I made two cakes, one in the smallest bowl as a "smash cake" for the baby and one in the biggest bowl for the rest of us to share. 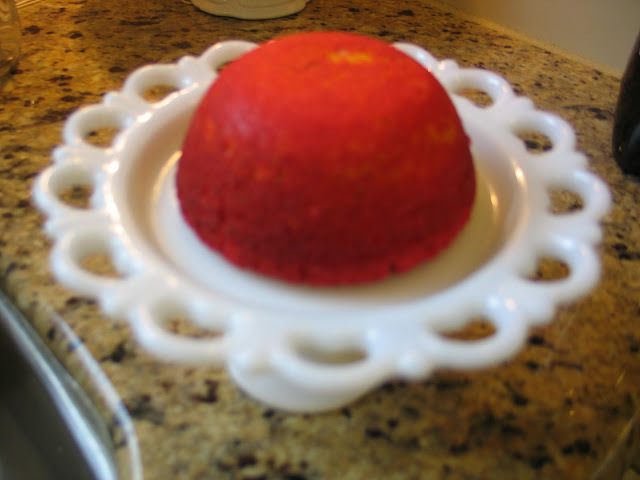 All you need are two simple ingredients: a white boxed cake mix, and some food coloring! 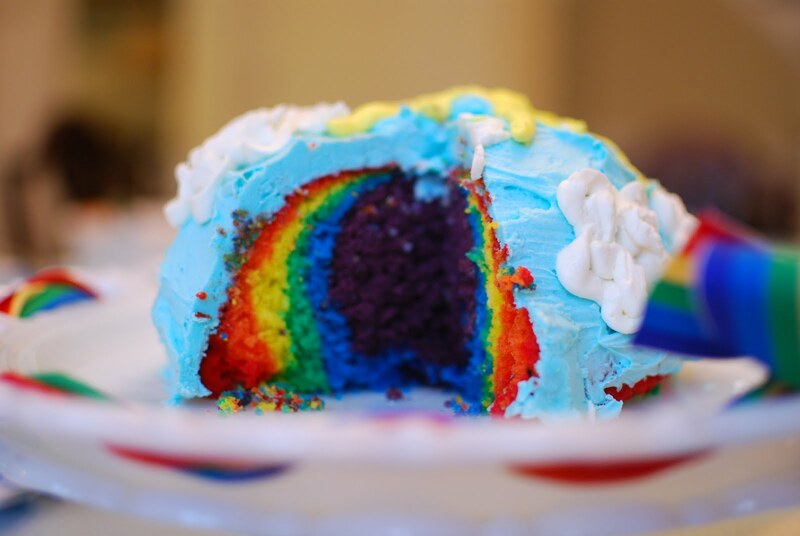 Don't worry, when you slice into it, you'll think you've discovered a pot of gold! Good luck! And if you try it, let me know how it turns out! 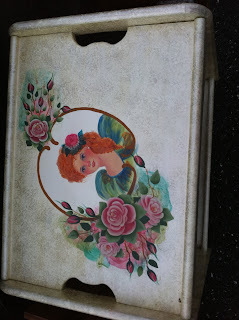 I'm linking up with Debbie-Doo's, My Junk Drawer and Beneath the Rowan Tree today, too! The Mini American Girl Cabana set is absolutely adorable, and should be a big seller! My oldest started setting it up immediately and above you see her "creation," though I didn't photograph it well. As always, I am thankful for even the smallest thing I find to make my girls happy and then to sell! What about you? How did you do? What did you find? Leave me a comment and tell me! 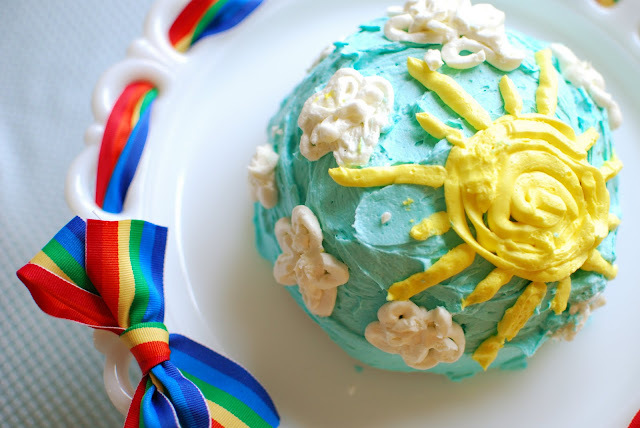 This weekend we finally got around to celebrating father's day and the beginning of summer (the official beginning, anyway). When the weather gets hot, one of our favorite things to do as a family is to head to the country (my young childhood hometown, I might add) to the only drive-in movie theatre around. 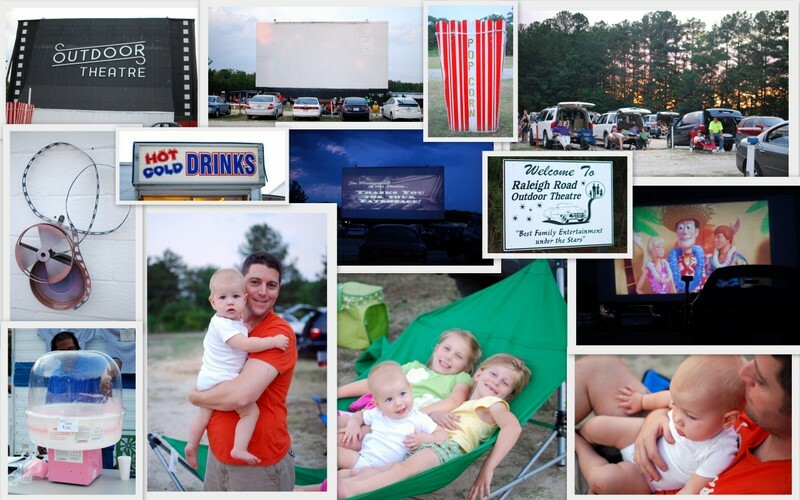 The drive-in here in Raleigh is great. It's exactly what you'd expect from an outdoor theatre. Everyone gets their pre-movie junk food action going and pigs out on popcorn, cotton candy, burgers, fries, and sno-cones. People show up two hours before the show just to eat, sit in the back of their pick-up truck and chat with friends. Then, as the evening grows dim and the sun begins to set in the west, the blue Carolina sky turns every shade of pink and all the kids get excited knowing the movie will soon begin. We set up a portable hammock and the girls swing and giggle. Darkness comes quickly and when the familiar "Let's All Go to the Movies" commercials begin, the girls change into jammies and snuggle under blankets in the back of the SUV. All is well at the drive-in. Of course, the perfect country drive-in night needs the perfect country drive-in outfit. And of course, I found it at the GW Boutique. Now it may not seem like much to you, but I was excited to find something that matched one of my favorite outfits for the girls. 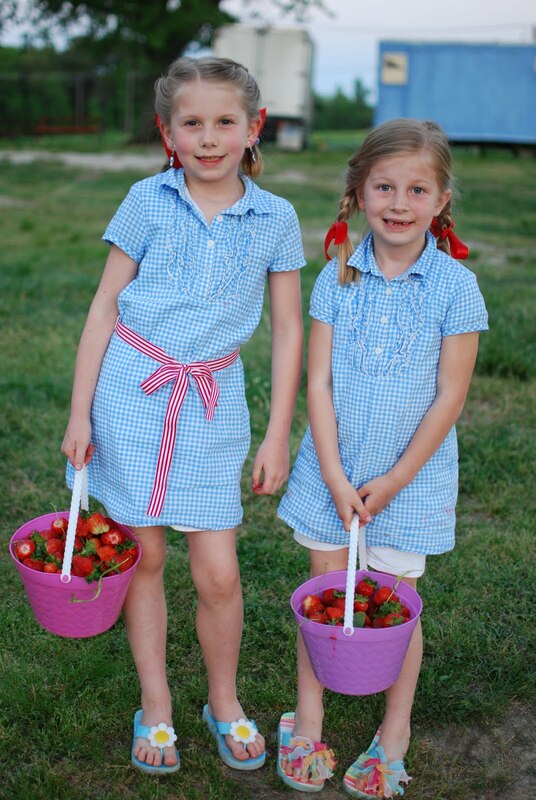 Anytime we want to look at little hee-hawish, we wear these cute blue and white gingham outfits. They have been perfect for horse parties, strawberry picking, trips to the farm, or country nights in the sleepy southern drive-in town. And now I can coordinate! Now maybe that's silly, but I think it is kinda fun for us all to match. Kinda fun for us, but perhaps kinda annoying for everyone else. Perhaps just a tad. But I'm okay with that because it makes my girls happy. We had an awesome time. Charlotte sported her country look in a plain old white onesie. Now this was not the plan, for her to look that Hee-Hawish, but I didn't bring the right pajamas and I had to let it go. She enjoyed sitting in the dirt and chasing the dogs around anyway so at least we didn't stain any nice clothes! As I sit here and write this post, I have been chuckling to myself because my outfit looks just like Cracker Barrel Barbie's. Now, please please please don't ask me what made me think of that, or how I know there was ever a Cracker Barrel Barbie, because for the life of me I can't recall. 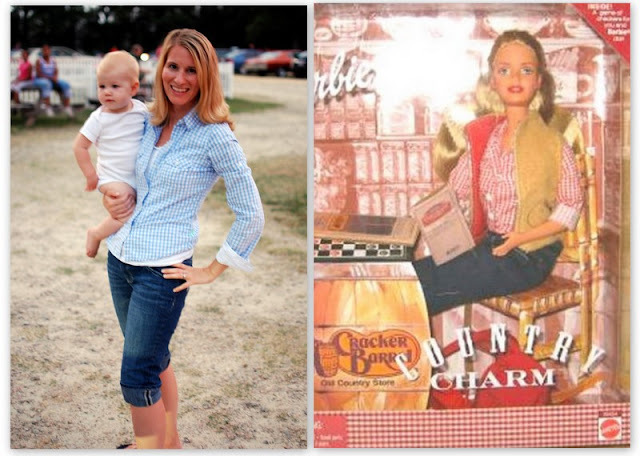 So I had to go search out a picture...and sure enough, my outfit is looking a little Cracker Barrel Barbie (in blue though, instead of red). There you have it. Country Charm Backwoods Barbie. From Goodwill. Loving it. Saturday's Spoils to come on Sunday. I hope you had a better morning than I did. I'm almost worried to hear about your finds because I might get jealous. Have a good weekend, ya'll! 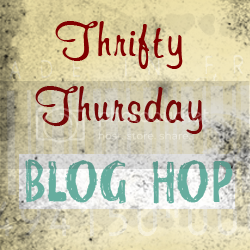 I'm linking up with the Apron Thrift Girl and The Pleated Poppy! It's that time again. It's Friday. How excited are YOU? How excited am I? I've got my Mountain Dew ready, my iphone charged up, and the snacks are ready. I will wake up at 6 am. I may sleep in my clothes. I certainly will NOT take a shower. And I might brush my hair and teeth but can't make any promises. I've already started planning my trip. It's one of my favorite things to do. My good friend thought it might be a good idea to show people how I plan for the sales, since she kind of had a tough time of it when we visited her in Charlotte earlier this month. So here's what I do! I always go to Craigslist first, because even though I'm typically pretty old school, I want the best sales so I need to be a little new school here. Craigslist is easy and free. People use it. Not everyone but most. 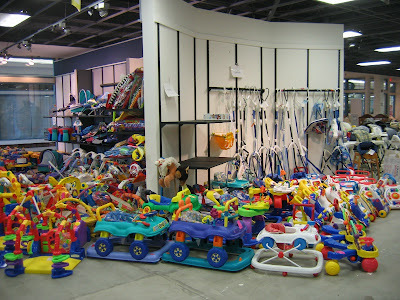 Plus you can sort out all of the sales that are too far away or don't have what you are looking for. Once you are in the garage sale category, narrow your searches. First I type in key words neighborhood, then community. This should pull up all of the neighborhood or community yard sales in your area. I hit these first--less gas wasted, more sales, more families with kid stuff. Then I search my zipcode and the zipcode next to mine, to see what individual sales are close to me. After that, I search by neighboring towns or areas to see what's happening there. Then I do a general search of "toy" or "kids" or "children's" to make sure I haven't missed anything. Some old school people like me still use the newspaper to find their sales. I actually look at our local newspaper online to make sure I haven't missed a good one. Our online classifieds are not easily searchable so I don't spend a ton of time here. Hopefully your classifieds are better than mine! Because I have a detailed plan for the morning, I usually don't follow random signs I see along the way unless I know they are taking me to a sale I have planned to attend! It seems like whenever I follow signs on a whim, I end up at a sale with nothing that I am interested purchasing. I'm not saying never follow the signs, but just beware of wasted gas and time. Are you ready for your trip yet? Remember Mr. Bell, who could fix everything but broken hearts? I've got a story for ya. 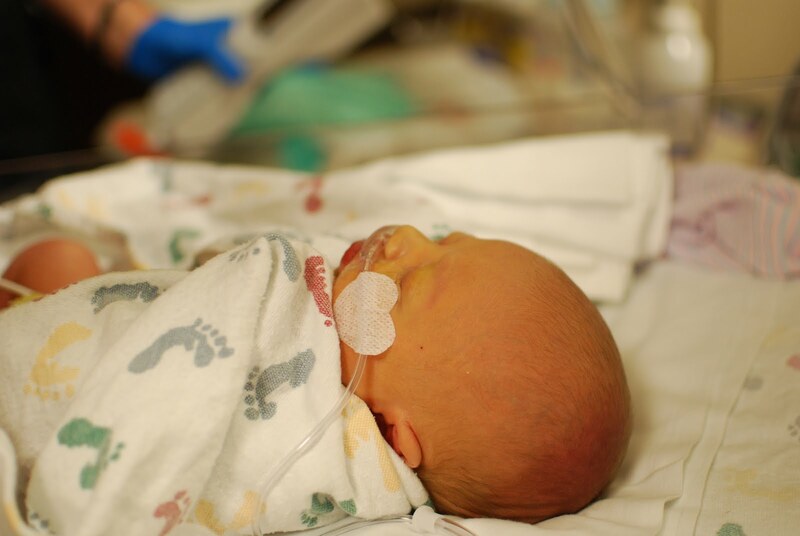 Little did I know that just a few days later, my newest little nephew, Jack Christopher, would be born. With a broken heart. You may remember that my very pregnant sister in law visited over Memorial weekend, expecting her first baby boy. 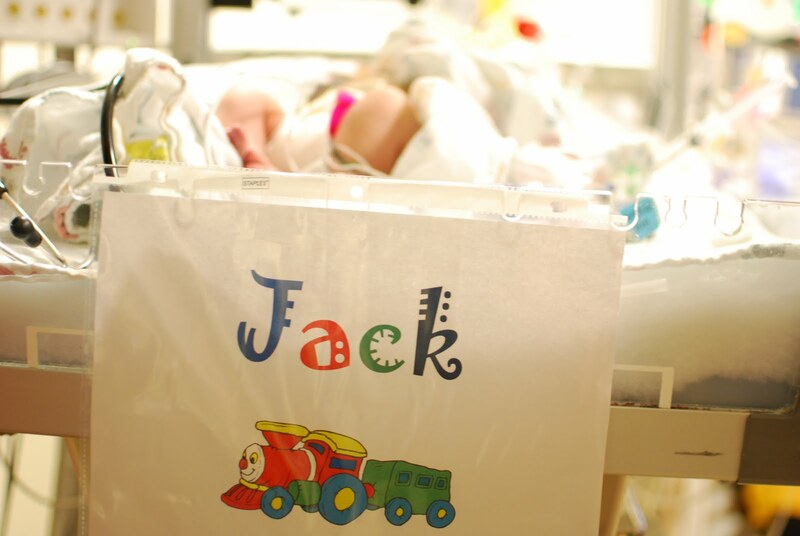 Well, within hours of Jack's birth, he was helicoptered to Children's Hospital (WITHOUT his mama, I might add) and underwent heart surgery at the ripe old age of 2 days. 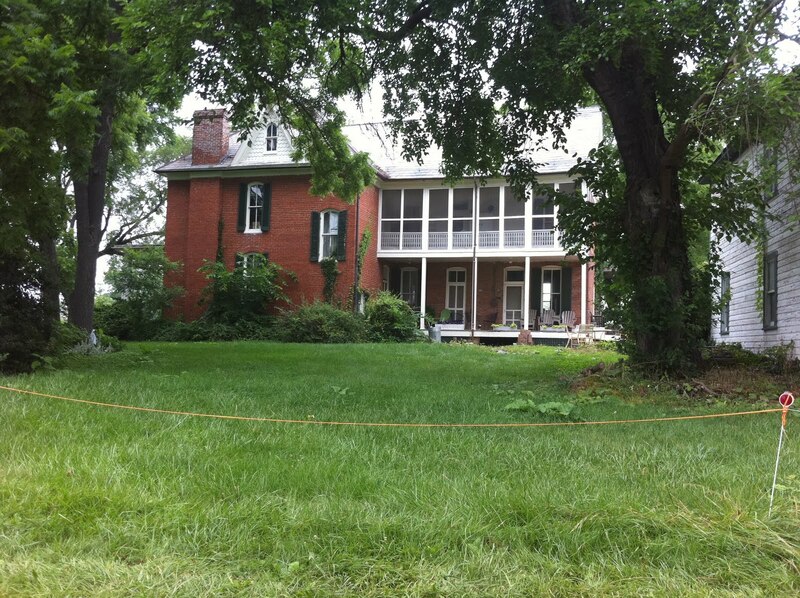 So this past weekend's Maryland trip was a little unexpected. But we just had to meet the little guy who had heart surgery and lived to cry about it, and we just had to go and give his mama and daddy a hug. Cause they're gonna need some hugs. Mr. Bell can fix everything but a broken heart. That's because only God can fix a broken heart. 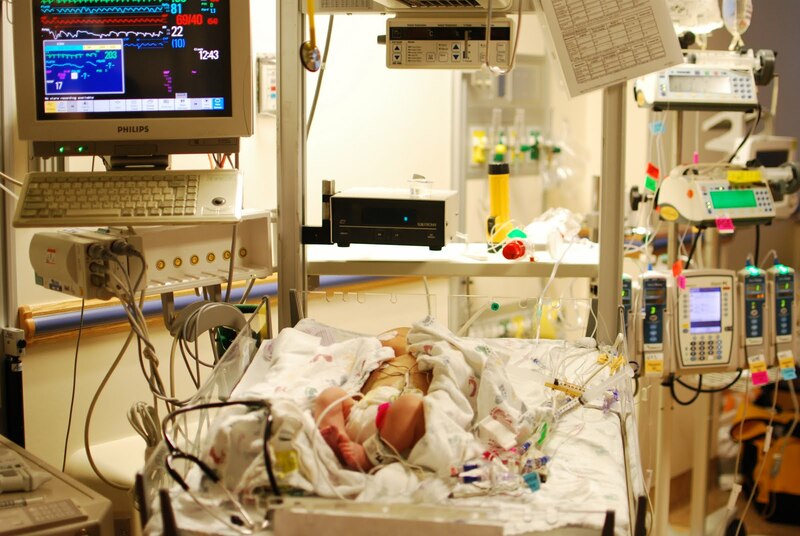 And if you, too, believe this to be true, would you pray that God would fix little Jack's heart? Recovery has been slow, and stabilization has been a tough road. There has been a lot of crying. There has been a lot of praying. And there has been a lot of trusting. That God will heal Jack's broken heart in time, that all things work for the good of those who love Him and who are called according to His purpose. But that doesn't make it any easier. As of now, Jack is still in intensive care, doing a bit better but he's got a long way to go. And we'll be praying for him the whole way through it. 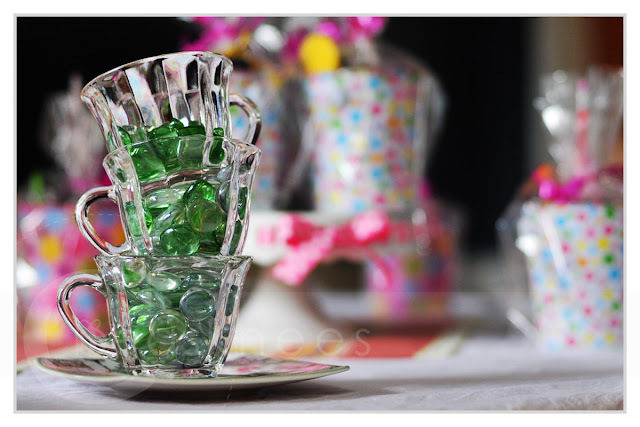 Thriftin' on Thursday: Abandoned Pretty Punch Cups find a Party! I get so excited by your comments when I hear you scored big at the yard sales and thrift stores! It literally makes me want to wake the baby up and take a trip to the GW Boutique (remember, that's Goodwill Boutique). If you can look past all of the discarded faux floral arrangements and picture frames, you can find some real gems. Just like my friend Laura over at The Bea Hive did. Here's her Thriftin' on Thursday testimonial! First, let me say that I am not a yard sale mommy. I am, however, intrigued by the Yard Sale Mommy and love seeing all the great treasures she finds. And speaking of treasures, I had my own great find this week, thanks to a little inspiration from the YSM. Around here, we do the big birthday party for our kids every other year. You know the kind - the giant inflatables, the bowling ally, the cooking class, the indoor playground, the horse farm, the swimming pool, the paint your own pottery... Yep, we've done all those and loved every minute of it. But this year is a small-party-at-home kind of year. 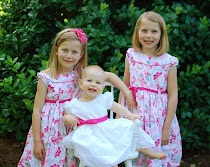 Since I have two June babies, we decided to have a little combined party, and the girls voted on "fancy tea party." Perfect! I'm picturing a handful of little girls, white table cloths (which I have), little fancy china bowls (have that), tiny silver forks (check! ), cupcake towers and cupcake shaped tea pots (got it, got it), crystal and silver platters (yep - have those), etc. This little party should be a snap to pull together. But as I started piling up all the tableware and linens on the dining room table, I realized I was missing the most critical element. I had no acceptable teacups! Strike that. I have very lovely china teacups that are part of my wedding china, but I'm not quite willing to turn those over to the little girls yet. 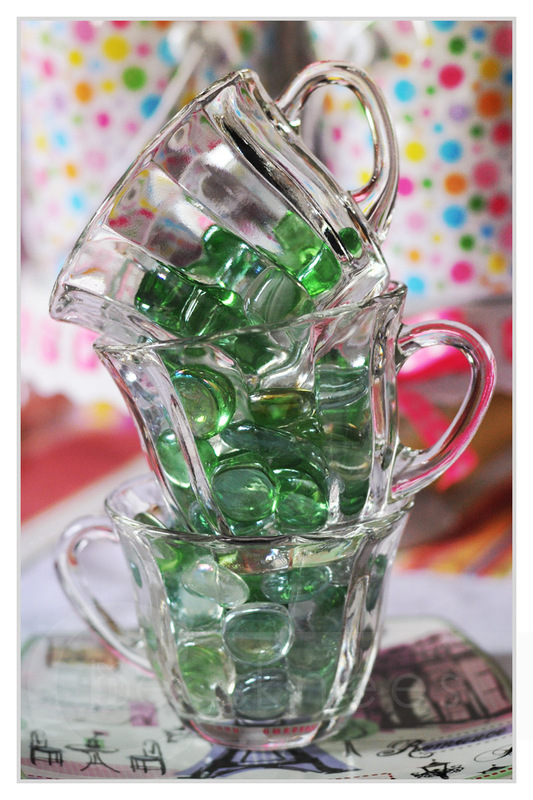 Thus began my search for little pretty clear plastic disposable punch cups. I can picture them in my head. The party stores do not have them. The big box stores don't have them. The arts and crafts stores don't have them. My daughter reluctantly agreed to hot pink plastic stemware as an acceptable alternative, but I wasn't very excited about that. Then yesterday I was emailing back and forth with the YSM, and I had a moment of inspiration. I armed myself with a fistful of $1s, picked up the little one from preschool, and headed in to my neighborhood Goodwill Store. 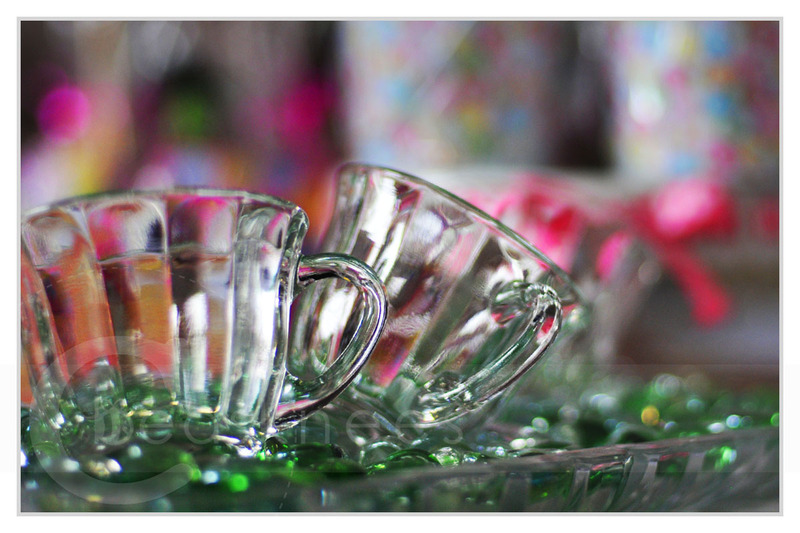 I made a beeline for the back wall, and within minutes I spotted a sweet little set of 12 glass punch cups resting on the top shelf. Each glass was marked 69 cents. Since I only needed 8, for less than $6 I walked out with a perfect little set of tea cups, and I will have them for many tea parties to come. I gave them a nice soapy soak, shined them up, and placed them on the table with the little square Paris cafe themed plates I picked up cheap at Home Goods. It was a match made in sweet deal heaven. The price tag made the search worthwhile, but the beaming face of my soon-to-be 7 year old when she got home from school made it even more so! I would never have though that the Goodwill shop could be a source to fancy up a little girl's party, but never say never! 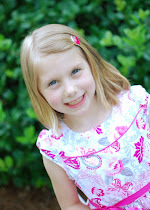 You can read more about Laura and her sweet family over at her blog, The Bea Hive. While you are there, check out more of her amazing photos, she's an excellent photographer! Do you ever have days like this? Days when you feel like something is exploding in your face and you can't get a breath? That day for me was yesterday. But today, I can breathe again. Last night was ebay listing night. In case you are wondering if I spend my every night up late putting my things up for auction, I'm here to say I don't. In fact, over the years I've learned something very important: get it all done at once. One week a month is all it takes. Just one week. I save up everything I have to sell, spend a few naptimes snapping pictures of everything Monday and Tuesday, spend a couple more naptimes making the listings, and then on listing night my husband gives the girls a bath and puts them to bed for me (sometimes even brings dinner home) and I spend the evening getting everything put up to auction. Now I can relax until next Wednesday night when I have to ship everything! Remember Mr. Shrunken Head "fun for the whole family" craft? Listed. And every single Barbie Dancing Princess ever made? Listed. Spike the practically life-sized dinosaur? Listed. Free loving family dollhouse and accessories? Listed. Now the fun part begins! Watching the auctions go is always the best part of the whole ebay experience. I began ebaying way back when my big girls were little babies. Getting up to nurse them in the middle of the night was so much easier when I had auctions to watch to keep me company! You don't have to be an every day ebay mommy to make money. Just a once a month ebay mommy is all it takes. 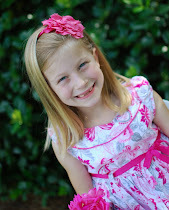 Don't you love Charlotte's little smocked yard sale dress? Hi! 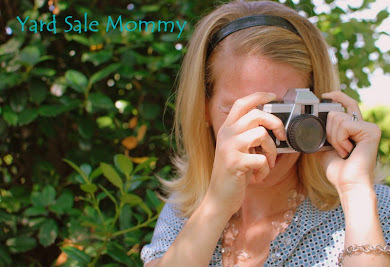 Today you can find some of my ebay selling tips over at Money Saving Mom. If you are visiting from that site, welcome! Spend some time on my blog checking out my yard sale adventures and ebay tips, as well as some ways to save money on your own personal and home fashion. If you've been visiting me for a while and are just checking me out to say hi for the day, hop on over to Money Saving Mom to see what I have to say about reselling on ebay! According to the "Truly Random Number Generator," my new friend "Kristen" is the winner of this week's giveaway! Kristen was #30 of 32 entries (maximum of 4 entries was possible per person), but since her blog is private and no email is listed, Kristen you'll need to contact me! If you are still visiting my blog Kristen, please email me at yardsalemommy@gmail.com. Also let me know which gift you would like out of the two choices. Thanks for everyone who entered! Please check back soon for something fun! My parents live in a town that hasn't changed much in the last 150 years. Pretty farms and antebellum houses line the main road through town and other than a private school and a convenience store, things in their town of Buckeystown, MD. still look the same as they did back in 1865. For the last couple of years, a big ol' brick house literally down the street from my mom and dad has hosted monthly "tag sales" in the old barn behind their house. I have never visited these "tag sales" when in town because I always thought I was more of a yard sale girl than a tag sale girl. Oh, I was sorely mistaken. 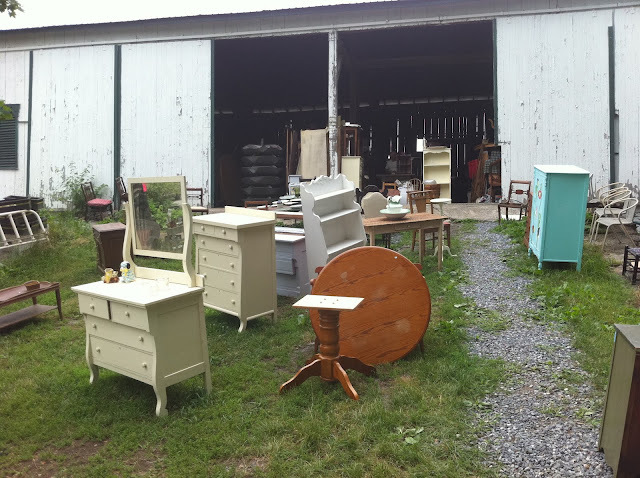 Before we reached the entrance of the sale, there was a yard full of furniture for sale. Fun but higher than yard sale prices, so we walked on. Fun green frames on the entrance. Getting ready to enter Chartreuse and Co. This "tag sale" was totally fun and made me want to redecorate my house! 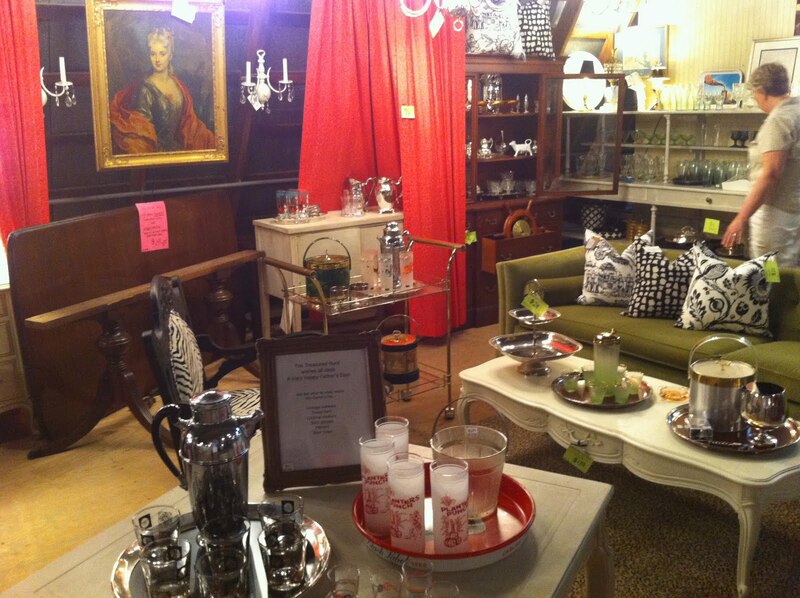 The prices were not dirt cheap, but all of the furniture had been painted and reupholstered. It was all so beautiful. 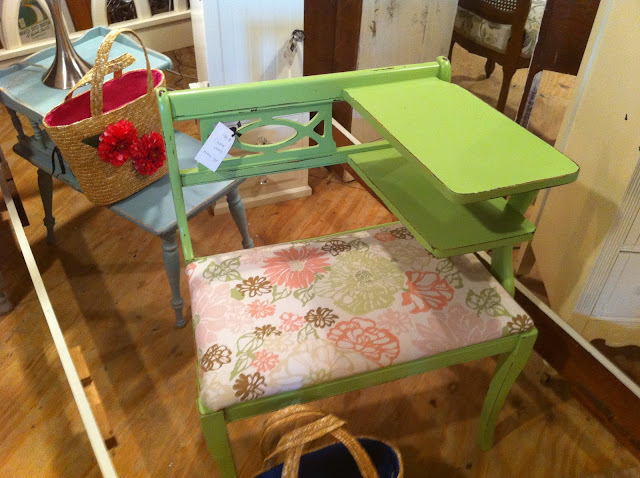 I loved this little conversation table in green and pink. 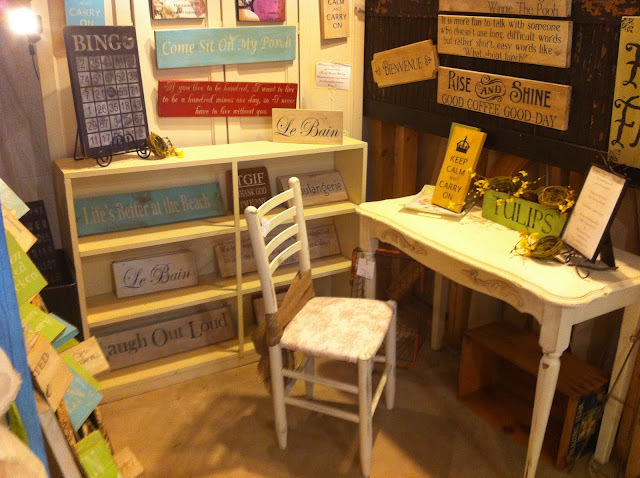 The barn was full of little sections filled full of treasures from different vendors. Each vendor had their own decorating style and sense. I loved seeing all of the uniquely designed rooms with vintage restyling and repurpose. The room below was very Mad Men to me, with an awesome velvet green sofa and fun high ball glass sets. I was very tempted to buy the aqua dresser below. 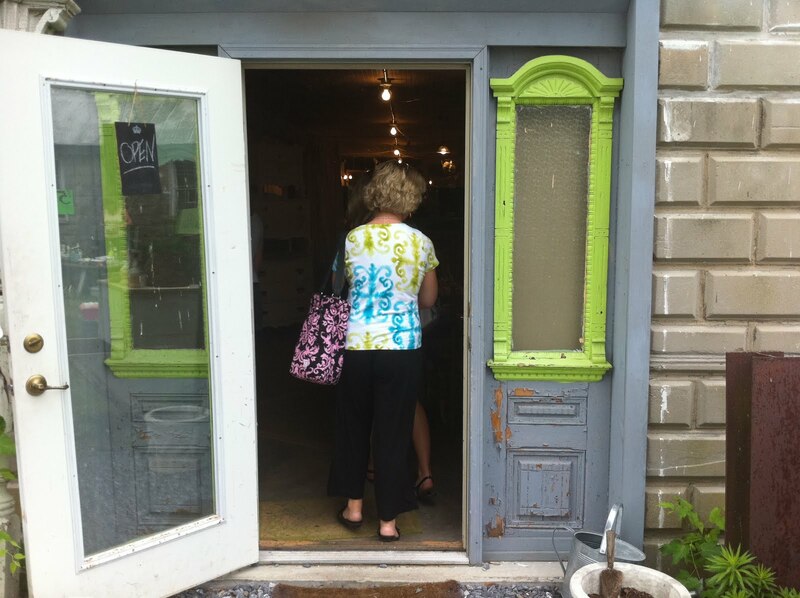 It was less than $200, had so much character and was less than any furniture store! 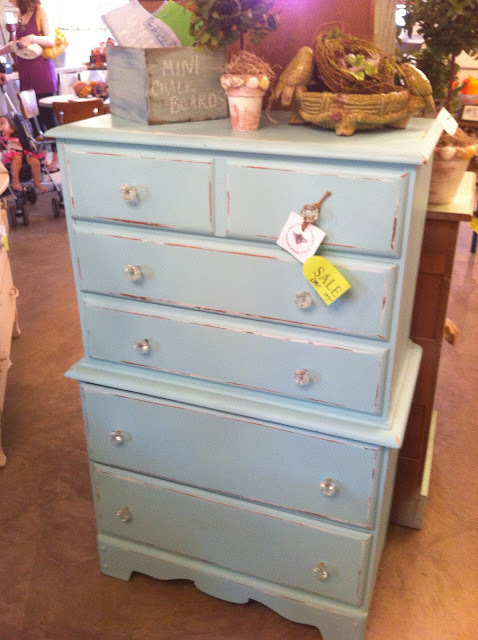 I'm inspired to maybe buy more furniture from yard sales and see what I can do with it. 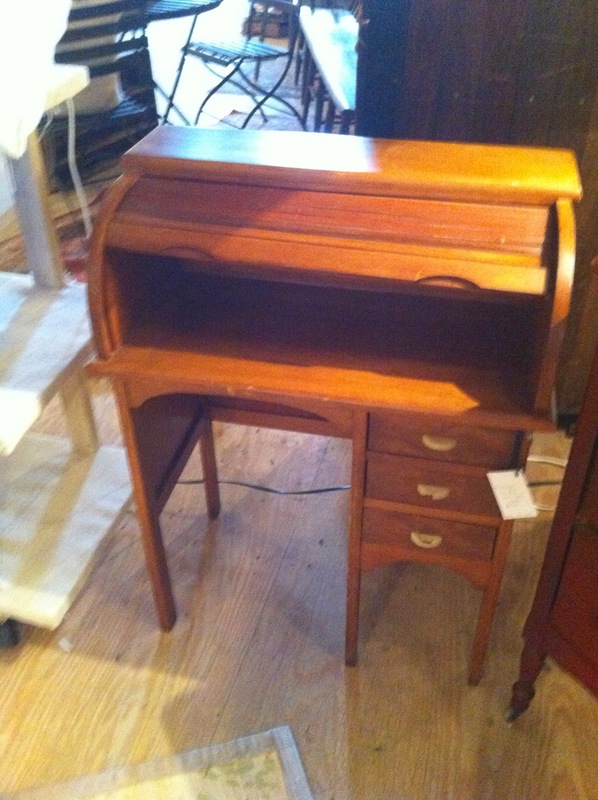 I LOVED this child size roll top desk. 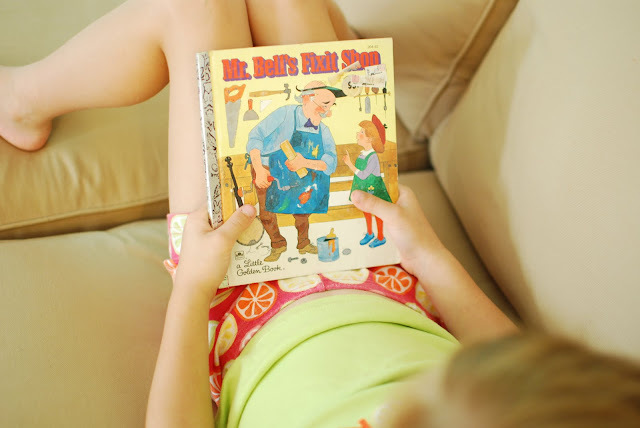 If you've been reading this blog, you know we love American Girl Books and Dolls. This desk is exactly like Kit's desk! Loved all the signs and this mommy desk. It would be perfect for my laptop. Love the Ballard Designs feel of all the furniture. This was a very fun experience and I feel very inspired to look for more old furniture at yard sales. I won't turn my nose up at a tag sale again! It was a crazy weekend of late-night traveling and stop-and-go traffic as we headed up to Maryland to see family. We had a new little nephew born this week and we wanted to come see him and his mama and daddy. After getting into town at 2am Saturday morning, believe it or not, at 6am I was up and at 'em ready for the rummage sale down the street. 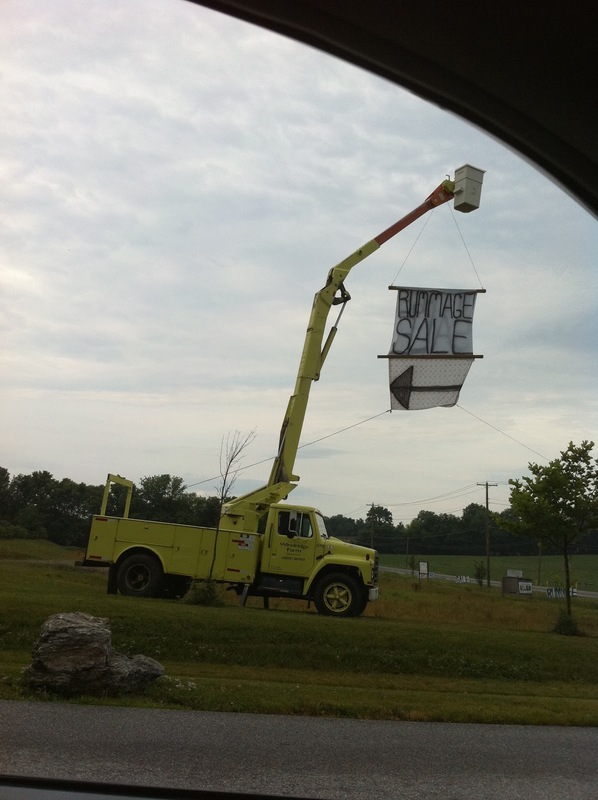 Nothing gets me more excited than a big truck with a yard sale sign 30 ft. in the air. I began to take pictures of some things I found "interesting," forgetting that I vowed to buy anything that was worthy of a picture! Well, almost anything. 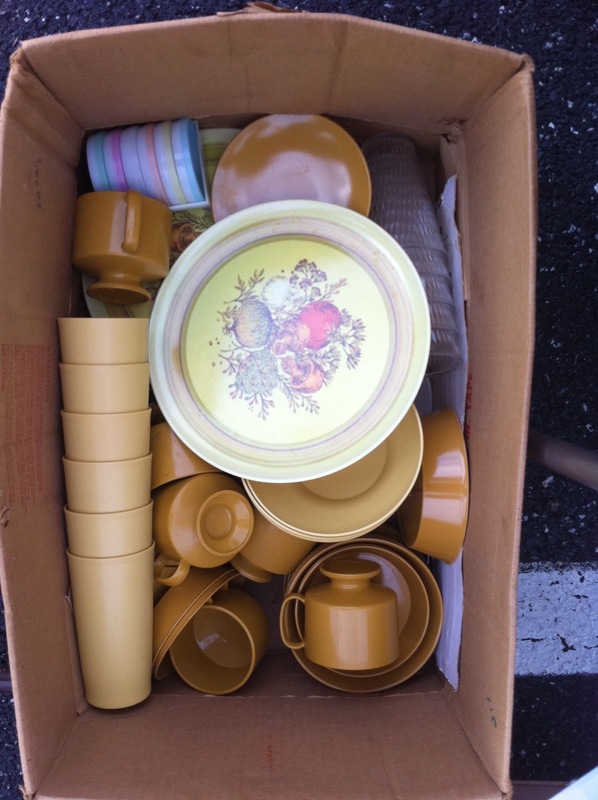 So this box of super 70's plastic dishes caused me to make a return trip and for $1 I bought all the vintage tupperware out of it. I used to love those tall tupperware cups when I was growing up, though we had the pretty pastel ones and not the yellowish ones I bought. 6 cups, bowls, and a vintage tupperware coaster set was $1 total. Someone spent a lot of time on this pretty lady. I also was fascinated with this Papa Smurf and Smurfette figure. I couldn't find anything like it on ebay when I looked it up on my phone so I picked them up for $2 for a pair. It was a risk, but hopefully it will pay off. Smurfs are pretty collectible! 9. My smurfs and vintage tupperware! How did your yard-sailing morning go? I know I'm slow, but I just discovered Instagram this morning when I was in bed surfing on my phone! (Hence the pajama pants and feet.) 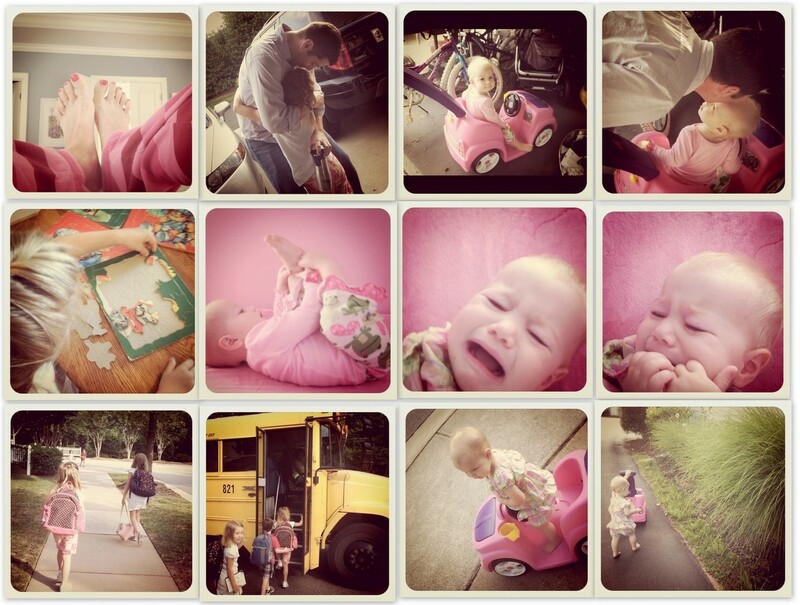 I decided to snap photos of my morning, Instagram style. I love this app! So I'm linking up with InstaFriday! Sound of Music Inspired...Favorite Yard Sale Find of the week! I knew I needed to buy them. How much? 2 for $3. Sold! These were the hit of Saturday morning. They walked up and down the stairs, they took on many voices and names, and they entertained one bald little baby until she had to go down for a nap. I sang "High on a hill was a lonely goatherd" all weekend. Sometimes you find things at yard sales you don't necessarily need, or even know if you can resell, but are worth $3 to bring a morning of joy to your sweeties. Especially your sweeties who love The Sound of Music. Of course, when the fluffy bird friends have lost their sparkle, they'll go up on the auction block. I hope to sell them for $20-$30 for the pair. Are you planning your weekend yard sailing trip yet? I'm linking up with the Apron Thrift Girl!